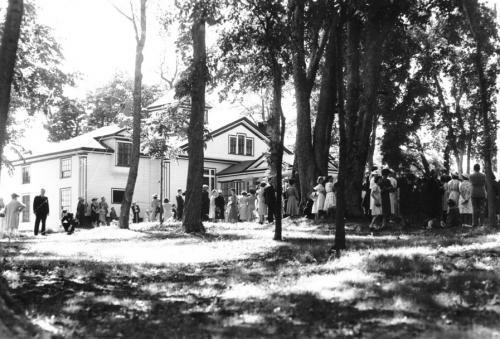 On a sunny July afternoon in 1940, “Clifton” the Haliburton Memorial Museum officially opened with fanfare and crowds. The program for the opening ceremony hailed the new museum as “symbolic of the fortunes of a number of [Nova Scotia]’s first aristocratic families, an eloquent reminder of the culture of the Province more than a century ago.” This goal to celebrate the accomplishments of Thomas Chandler Haliburton, one of Canada’s earliest authors, was reiterated in 1960 when Haliburton House officially became part of the Nova Scotia Museum, as one of the first “branch” locations – along with Uniacke Estate Museum Park, and Perkins House Museum. In recent decades, Thomas Chandler Haliburton’s long-accepted role as an important figure in Nova Scotia’s history has been the subject of ongoing research and debate into not only his contributions, but also the lives and contributions of those around him. When Thomas Chandler Haliburton decided to build his estate in Windsor, Nova Scotia in the 1830s the township had a reputation for beauty, social prestige, and of course King’s College – where Nova Scotia’s elite sent their sons to be educated. Windsor was also home to Haliburton – where he had been born and educated. And so, it made sense for the up-and-coming author, lawyer, judge, politician, and business man, with his family of eight children, to build his estate in Windsor on land he already owned overlooking the town. Clifton, named for the English birthplace of his wife Louisa Neville, was designed and built to reflect Haliburton’s status as a ‘gentleman’ in Nova Scotian society. The house, now much changed from its original appearance, was often the center of upper-class social events in Windsor, hosting dinners and parties with dancing, music, and cards for the “proper sort” of guest from Windsor and travelling from Halifax. In colonial Nova Scotia, large estates like Clifton were not just scenic retreats – they had to earn their keep. The estate had abundant agriculture and gypsum mining operations, evidence of which is still seen on the grounds today. Additionally, significant staff were needed to run the home and estate, for the most part from outbuildings tastefully hidden, and now no longer existing. 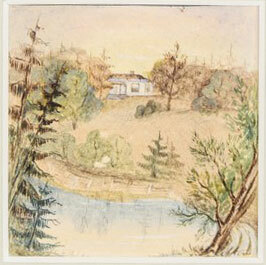 Watercolour believed to be painted by one of Haliburton’s daughters. Water in foreground suggest gypsum quarry was no longer in operation at time of painting. NSM 89.95.7. The touches of Louisa Neville Haliburton were seen throughout Clifton – from the estate gardens to the elegant drawing room. In 1841, only five years after Clifton had been completed, Louisa died at the age of 48. With the help of his children, Haliburton continued to maintain the estate until 1856 when he finally moved permanently to England. Clifton would pass on to several owners before being saved from decay and purchased, in 1939, by the province to be turned into a museum. Each owner changed Clifton in their own way, to suite their own purposes for the property. These architectural changes seen in the house today provide glimpses into the town of Windsor’s history. 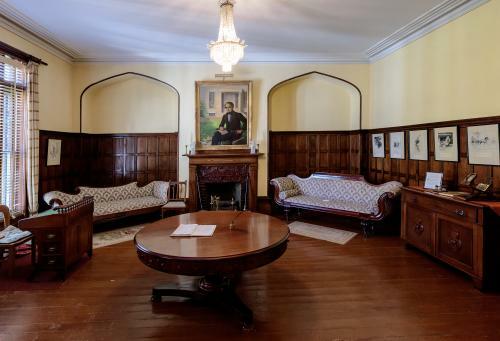 Today, visitors to Haliburton House Museum still find echoes of how the estate would have functioned during the aristocratic days of Thomas Chandler Haliburton. However, it is the spirit of Clifton as a gathering point that most closely reflects its history. 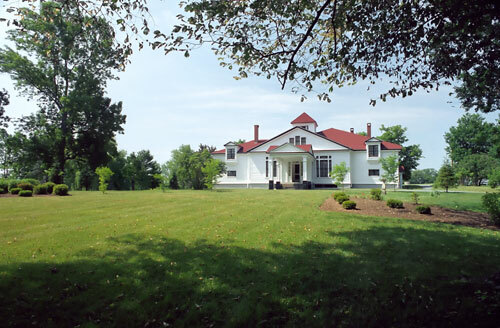 In addition to the historic house museum, the estate hosts the Windsor Hockey Heritage Museum and the Clifton Estate Disc Golf Course.